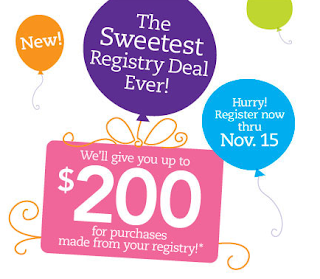 For the first time ever, you can get up to $200 for purchases made from your registry. Simply create your Baby Registry between Sept. 16 and Nov. 15! Then you’ll receive a Promotional Gift Card e-mailed to you approximately 10 weeks after your expected arrival date, valued at 10% (up to $200) of the items purchased from your registry. * For more info and to sign up go HERE. Babies“R”Us is THE leading dedicated baby products retailer, and its registry, to date, has been used by more than 18 million parents. I love to do my registries right in the store. There is nothing better than feeling like you can have anything in the store if you want to. Scanning all of your favorite items make it so fun and you may even discover products that you didn't even know were out there. Some of our favorite must have baby items are the 4moms Mamaroo, swaddle blankets, baby bedding and clothing. Due to its unmatched assortment of innovative and exclusive baby products and trusted expert assistance from Registry Consultants or online resources, registering with Babies“R”Us is a smooth, seamless and efficient process. While in-store, registrants will also receive additional perks, such as a special welcome package, which includes a Baby Registry Planner with a full checklist of essential items, invitation cards to inform family and friends that they are registered at Babies“R”Us, a $5 off $25 coupon, product samples and more. Just make sure to visit Babies R Us HERE to start your registry. You can also visit their FACEBOOK & TWITTER. One lucky TTGG follower will be winning a $50 Babies R Us Gift card! The Babies“R”Us information and gift cards have been provided by Babies“R”Us. I would buy Pampers diapers and wipes. I would get cloth diapers and wipes. I would buy a Beaba all in one baby food maker. I'd put this towards a car seat like the Graco Nautilus 3-in-1 Car Seat - Breakers. I would get the Burt's Bees Baby - Velour Terry Robe - Natural. I would put it towards two convertible car seats for my twin grandsons. I would buy a baby monitor! I'd get the Trend Lab Chibi Zoo 6-Piece Hooded Towel and Wash Cloth Bath Set - Green. Thanks. If I won, I'd use the gift card towards Pampers Swaddler Diapers! My husband and I are expecting our first baby this fall! I would buy new sheets or bedding! It would help buy a Radio Flyer wagon. It would go towards a new stroller. I would buy pampers diapers and wipes for my sister in law who is pregnant. I would buy dreft, diapers, cloth diapers, and wipes! I would stock up on diapers and finally get The Diaper Genie! I would buy the diaper genie.